These Farm Heroes level 243 cheats and tips will help you beat level 243 of Farm Heroes. 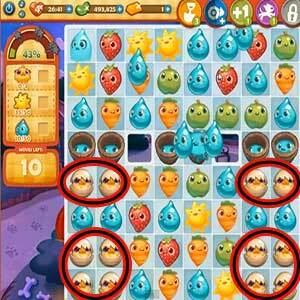 The objective of Farm Heroes level 243 is to collect four chicks, 50 suns, and 50 water drops in 20 moves. There are many blockers in this level including: water barrels, ice flowers, and ticking crops. These provide a large distraction from the you goal of collecting crops. Your first step in this level should be using one of your boosters preferably the magic shovel booster. From that point it should be relatively easy to make similar matches, there is a lot to work with on the board. 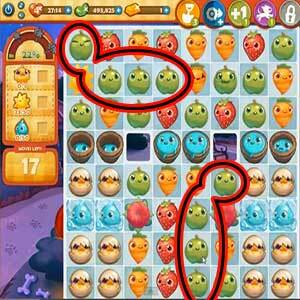 3+ match combo’s will crack the eggs in this level releasing the chick for you to collect. Making this combo’s should be fairly easy not only do you only have four to collect, but most of the half hatched eggs on the board are coupled together already. 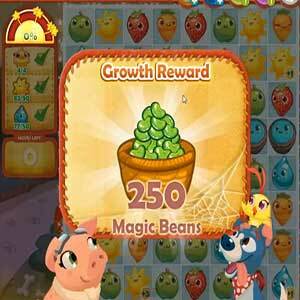 At the end of the level you will achieve maximum growth once all your crops are collected, after this you will be awarded 250 magic beans. Rather then spending these beans you should store and save them for a harder level, preferably when you have to face Rancid the Raccoon. All intellectual property rights in and to Farm Heroes Saga are owned by King.com Limited, including copyrighted images and trademarks from Farm Heroes Saga. The Answers Network is not affiliated with King.com Limited in any way.